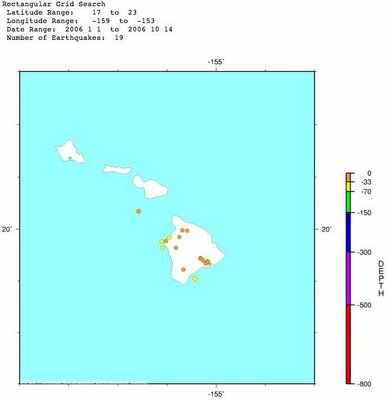 Chris at Highly Allochthonous has a very interesting post about the cause of the Hawaiian Earthquake. I made a quick comment there, and I want to expand a bit on it here. 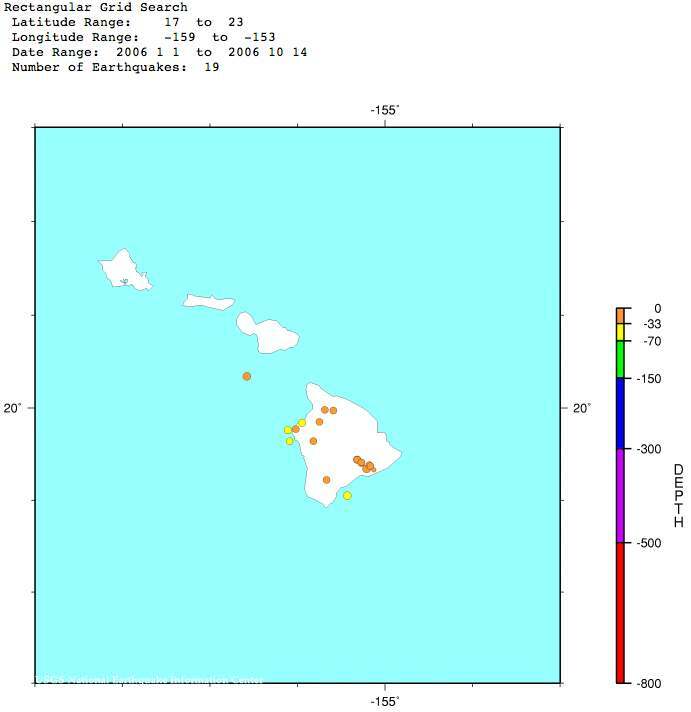 The USGS fast moment tensor solution for the Hawaii quake looks like a dominantly strike slip event. That seems weird to Chris, and it does to me too. I'd expect normal faulting to be the dominant mechanism resulting from extension (for the reasons that Chris describes). Before I go on I should point out that the Harvard solution looks more like a normal fault with a bit of strike slip motion. 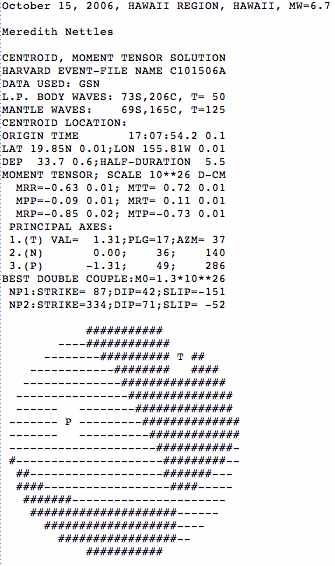 What that mean is that the following attempts to explain a strike slip earthquake in that part of Hawaii may be pointless. But oh well. I'm going to write the rest of this post assuming that the USGS focal mechanism is the better of the two. Here's a quick map I put together of the Hawaii region (I wish I could plot the individual solutions but that's currently beyond my plotting skills). Earthquakes are from the Harvard CMT catalog (blue is thrust, red is normal, and green is strike slip). I think that these would be the best events to compare to the event on Sunday because the focal mechanisms for all of these event were inferred from teleseismic data (probably from a lot of the same stations). 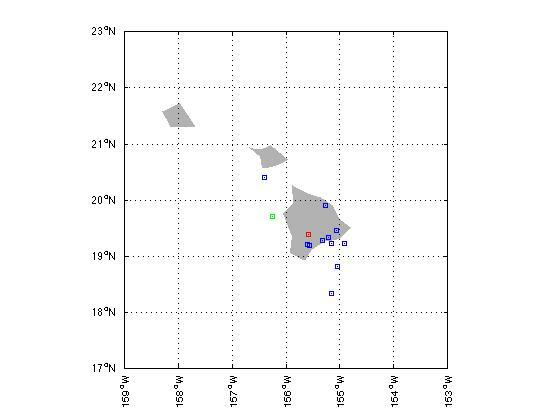 From that map it looks like thrust events are the most common at Hawaii. That seems a bit counterintuitive to me. That means that the least principle stress is horizontal and the greatest principle stress is horizontal (I'd expect just the opposite since, as Chris pointed out, the Hawaiian Islands are a big pile of rock on the crust – I'd expect them to be collapsing). Despite my misgivings, in terms of stress state switching from a stress state that favors thrust motion to a stress state that favors strike slip motion is pretty straightforward – the least principal stress needs to switch from vertical to horizontal with the greatest principal stress remaining horizontal. Basically the least and intermediate principal stresses need to switch. If they're close in magnitude to begin with then it won't take much for them to switch. I can only speculate about what the perturbation to the stress state was. Maybe motion of magma, stresses imparted from plastic flow in the mantle, or maybe through loading caused by failure along other faults in the time preceding the earthquake (slip on one fault can affect the stress state on neighboring faults). There were quite a few earthquakes, and there were some deep, moderate sized earthquakes (M 3.3-4.7) in the general vicinity of the Oct. 15 earthquake. Perhaps the least and the intermediate principal stresses were very similar in magnitude and those events perturbed the stress field enough to switch them changing the style of faulting (for that event) from thrust to strike slip (of course that's just speculation on my part). I want to finish with a comment on the greatest principal stress. The orientation of the greatest principal stress inferred from both the NEIC and the Harvard focal mechanisms is the same (~NW-SE). That orientation looks similar to the one I'd infer from the historic NEIC focal mechanisms. It's also similar to the stress orientation from the World Stress Map (which was inferred using focal mechanisms in Hawaii). Since all these events have a common orientation for the greatest principal stress that indicates to me that they're the result of a similar stress field, with the difference being with the intermediate and least principal stresses. As I said above, if the intermediate and least principal stresses are similar in magnitude, then it wouldn't take much for them to switch. That's a long-winded way of saying that I don't think the stresses that caused the Oct. 15 event had to be radically different than the stresses that caused the more common thrust events. UPDATE: The lab lemming has a new post about the possible cause of this quake. UPDATE: Editing to correct spelling errors, 10/22/2006. Interesting - now all we need to to is figure out the major control on the stress field. I still can't really square it with plate bending. It seems to me that one would expect extension to cause earthquakes in the upper 5 or so km of the island, but that these might be relatively weak earthquakes caused by collapse of the badly built pile of pillow lavas that dominate subaqueous Hawaii. For deeper earthquakes, I wonder if the isostatic subsidence of the big island of Hawaii is causing the lithosphere to squeeze the roots of the sinking island, similar to how rocks in the center of a fold are squeezed.